Samuel Ledgard was an independent operator in Yorkshire. Starting a business in 1912, operating on hires, his first bus service ran in 1924. His company then grew, acquiring many small operators in the Leeds and Bradford areas. One of these acquisitions, of the Moorfield Bus Company in 1934, included 2 routes between Otley and Horsforth. In 1952 Samuel died, the Company passing into to the control of his Executors for the remainder of its existence, one of whom was his son, Tom. In December 1964, green RLH 4 was purchased from London Transport, via a dealer. Over the next few months, another similar three were obtained, as in the table below. Also in 1964 and 1965 8 RTs (RT 194/3496/3499/3505/3524/3597/3600/3610) were purchased direct from LT in addition to 5 from their second owners Lesney Products (RT 340, RTL 305, RT 1395) and Super Coaches, Upminster (RT 2496/4265). Ledgard vehicles carried no fleet numbers, being referred to simply by their registration numbers. 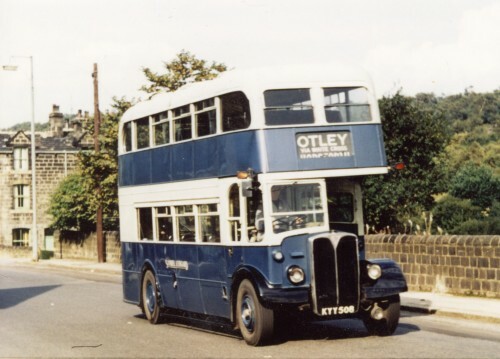 The four (first batch) RLHs were used on two slightly different hourly routes between Otley and Horsforth, together with lowbridge Leyland PD2s which came from Ribble. Each bus would cover over 200 miles in a day. 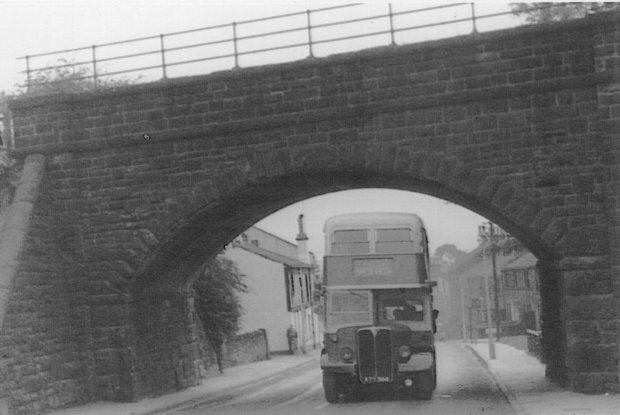 One of the routes contained a low stone arched railway bridge, over Henshaw Lane in Yeadon. This bridge carried a short Midland Railway branch line from Guiseley to Yeadon for freight traffic (passenger trains last ran in 1954), but the line was closed in 1964. The bridge has since been demolished, but the sides still remain in 2007 next to the Station PH. In his book (see below), Don Bate recalls that the RLHs would be routinely carry 80 schoolchildren (3 to a double seat, plus standing), making them extremely crowded! Above: RLH 8 (author and copyright unknown). 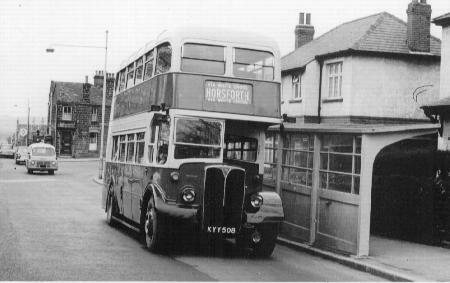 The RLHs were based in an out station at the old premises of the Moorfield Bus Company in Yeadon (approximately midway along the routes), along with only 6 other buses (all being double deck). The RLHs were preferred and used on the main services wherever possible, with the four PD2s used on duplicates and schools services. There was also a Leyland PD1 (used only if essential) and, from August 1967, a highbridge AEC Regent III available. Yeadon was the most modern of Ledgard's depots, having been rebuilt during the late 1940s. The principal maintenance depot of Samuel Ledgard was at Armley, however the only times the RLHs visited it were when they were initially painted in the company livery and for heavy maintenance (which only happened a total of twice). Above: Armley depot roof in Easter 1965. Second from left, KYY 502 can be seen prior to painting in Ledgard colours. Photo by P. Larkham. Ledgard services finished when the company was sold to West Yorkshire Road Car Co. Ltd. on Saturday the 14th October 1967. None of the above mentioned vehicles operated again after that date. On the final day of operations, the total fleet contained 99 vehicles, only a few of which were retained. The buses from Yeadon depot were said to be taken at midnight to the West Yorkshire depot at Bradford for storage. Many of the 'Moorfield' staff left the bus industry. Immediately following the takeover, the former RLH routes were numbered 78/78A/78B and worked by lowbridge West Yorkshire vehicles out of Otley depot. During 1968 the RLHs were sold on to dealers, and Yeadon depot was demolished to make way for housing. Forty years after the last Ledgard service, RLH 32 was painted in the old company colours, and journeyed north for a one day re-creation of the routes the ex-RLHs mentioned above used to work, as part of a free running day. Peter Gould's Historic Bus, Tram and Trolleybus Fleet List Archive also contains more information on the company history. Publisher: Autobus Review Publications Ltd.